Revisiting some of Ralph Meatyard's work yesterday made me think of two other photographers whose work I loved, Bill Owens and Henry Wessel. Turns out both of them have books out too. 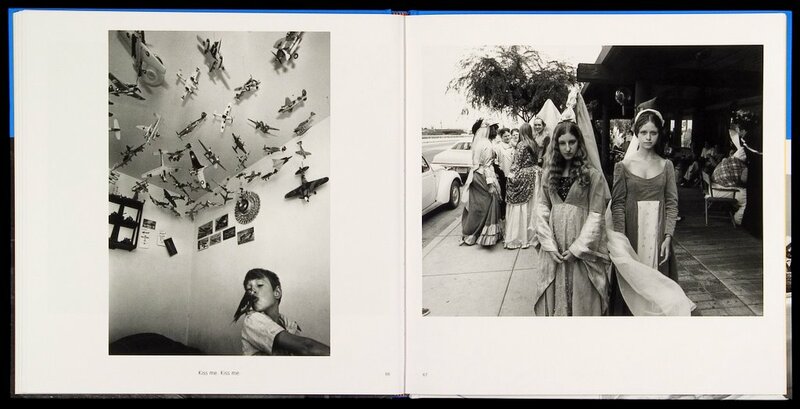 Owens, of course, was and is famous for his 1972 book Suburbia, one of those iconic photo books that always get mentioned in photo histories. It was reprinted in 1999 in a new and improved version (seriously—a red sunburst on the cover proclaims "New and Improved!" in a not-so-sly trot on that particular modus of conventional retail advertising. Unlike most things so labeled, however, the new edition of Suburbia actually is new and improved, with better editing, better printing, and added content). His newest book, Leisure, which the spread above comes from, is actually the completion of his four-book series on American middle-class life in the 1970s (the other two are Our Kind of People  and Working: I Do It For the Money ). Leisure, published last year, is presumably the project's coda. It's always seemed to me that many "real" photographers fly just beneath the radar. Photography—Ansel, Avedon, and Annie notwithstanding—isn't generally a star vehicle: it's not easy to make a great big splash and maintain a cult of personality. But the interest in the pictures and their subjects flows with a strong current that can survive the ups and downs of fortune and penury, fame and obscurity. Owens is, as much as anything, like a bright cultural anthropologist with a visual flair. Past the admitted irony present in most honest photographs, you can sense and see his interest and fascination with the decade of his youth and his relationship to it. It's an old philosophical question: how much are we a part and a product of our communities, and how much are we opposed to and apart from them, pulling against their requirements and observing them as if from the outside? In much of the time since his three great books came out, Owens has been running a brewery in California. I know even less about Henry Wessel than I do about Bill Owens, apart from the fact that I have the same affection for some of his exquisitely uncomposed 1970s documentary pictures; I probably only associate the two photographers with each other because I became aware of their work at the same time of my life. I've requested a review copy of his latest book, which appears to be a pastiche of five earlier, smaller books. I'll report back to you if and when I ever get to see it.